The premier indoor trampoline park in North Orange County offers high-flying fun for the whole family where you can literally bounce off the walls! 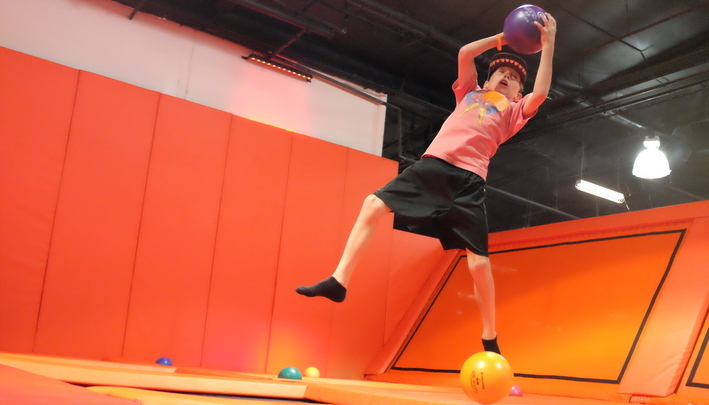 The 17,000 square feet of jumping surfaces include trampoline dodgeball courts, slam dunk courts, foam pits, launch pads, a rock climbing wall, battle beam and massive freestyle court. 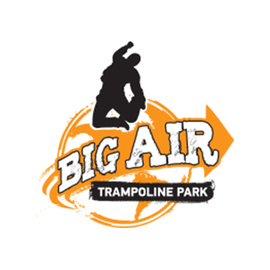 With so much to do, Big Air is the ideal venue for your next birthday, team party, and/or group event. WHAT CAN I DO AT BIG AIR? Bounce off our wall to wall trampolines on our OGC Zero Gravity Courts, play trampoline dodgeball on the Haley’s Dodge It Courts, jump off the Launch Pad and into our foam pits, slam dunk on our Space Slam basketball hoops, ride the mechanical bull, celebrate birthdays, host fun group events, face your opponent on Galactic Gladiators Battlebeam™ and more! GET JUMPING! Once you arrive at the park your ticket will be printed in the form of a sticker that will designate your jump time (jumps start every 15 minutes). HOW MUCH DOES IT COST? $12 for the 1st hour and each additional hour is just $6! HOW MUCH DO I PAY IF I’M NOT JUMPING? Nothing! 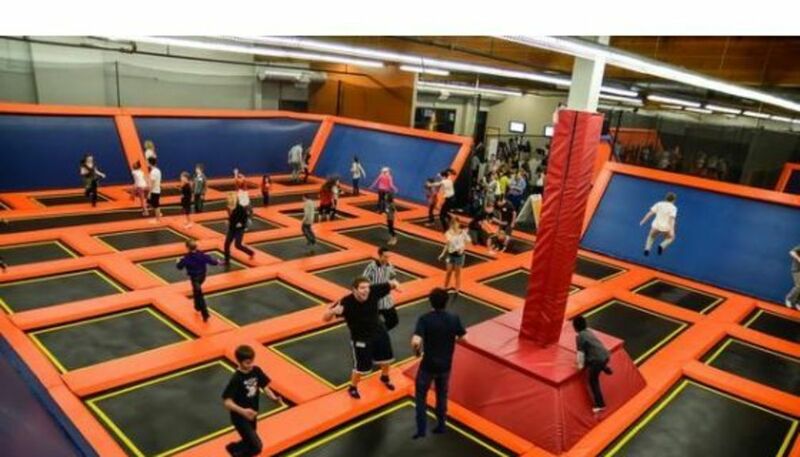 Those who are not jumping do not pay admission. HOW OLD DO YOU HAVE TO BE? Big Air welcomes all ages! 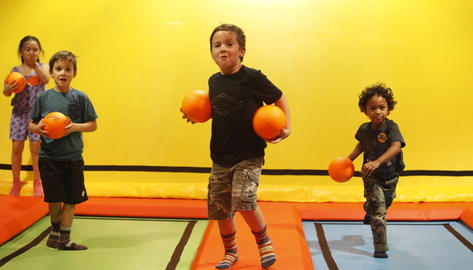 If younger children want gentler play, they can enjoy Lil’ Air, where our trampolines are dedicated for ages 6 and under. WHAT DO I WEAR? Jumpers should wear comfortable and appropriate athletic gear. Socks are required for jumpers and special non-skid socks are recommended. Air Socks are available for purchase at the park. 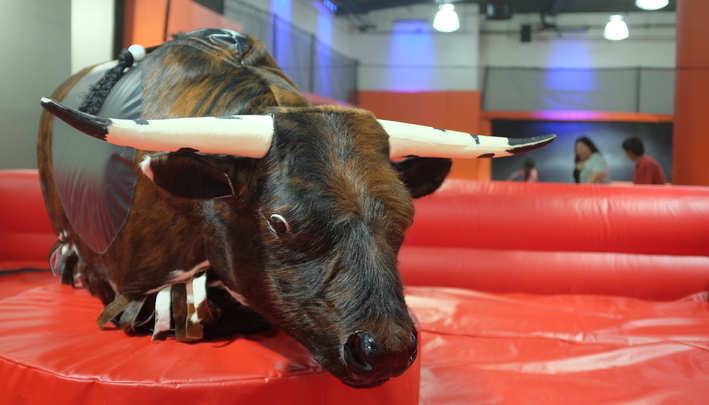 WHAT IS THE WAIVER THING? 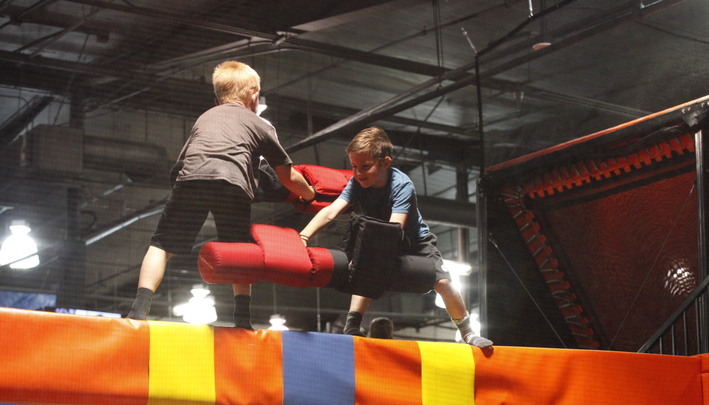 All Big Air Trampoline Park participants require a signed liability waiver. Everyone under 18 must have a waiver signed by a parent or legal guardian. All guests 18 & over must show photo ID. The waiver is valid for a year. WHAT IF A CHILD UNDER 18 COMES WITHOUT A PARENT? Kids are allowed to jump without their parents present as long as they have a completed waiver on file. 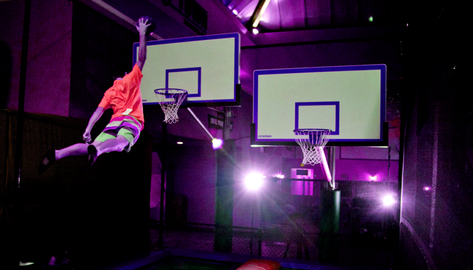 Every participant under age 18 must have their waiver signed by a legal guardian in order to jump. 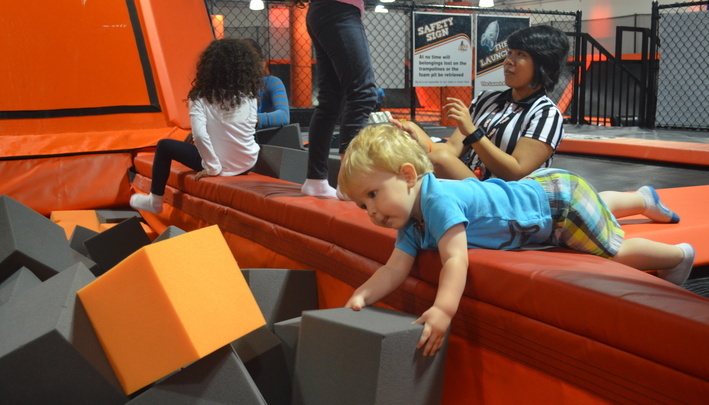 Waivers can be submitted online and sent to our database so kids can get jumping quickly. DO YOU SERVE FOOD? Yes. You can purchase food at Big Eats, our snack bar that serves items such as pizza, corn dogs, Icees and Pepsi products with seating for the whole family. Every Friday and Saturday night at 8:00PM, Big Air Trampoline Park is transform ed. We turn down the lights, turn up the music and fire up the lasers and strobes. Enjoy access to all the attractions at the park. The price of admission covers the entire duration of Cosmic Nights. Call to inquire about our brand new Cosmic Nights party packages!